Have you ever wanted a freestanding bathtub? Here are six advantages of freestanding bathtubs for your consideration. Have you ever wanted a freestanding bathtub? Although you might expect the bathroom remodeling process to be a lengthy one, it doesn’t always have to be. Sometimes all you need to do is change one aspect of your bathroom. Here are six advantages of freestanding bathtubs for your consideration. 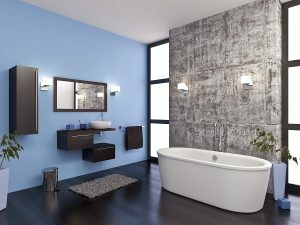 First of all, freestanding bathtubs are highly versatile. No matter where you’d like to put it, it will fit in with the rest of your bathroom. When your bathroom is big enough, it can be the literal centerpiece of your remodeled bathroom. When you can do this, you won’t need the walls for support. Another element of the bathroom remodeling process to consider is what you will do with the tile. Over time, your tile can be ruined by mold, mildew, and grime that builds up in your bathroom from all the moisture. However, freestanding bathtubs can shine the spotlight on your bathroom tile, so make it count. It’s time to make sure your bathroom floors are as beautiful as possible. Chances are, your neighbors won’t have any freestanding bathtubs in their home. So, installing such a tub can be a way to show off your personality. Impress your guests, and make it a talking point over coffee and cake when you’re entertaining. Built-in tubs are far more conventional and are bound to be the standard no matter where you live. Having a freestanding bathtub in the middle of your floor can set you apart. Now that you decided to get a freestanding tub, the next question to answer is, what will it be made of? You’ll have many choices to make, not only when it comes to the base material, but also the colors and styles you would like. You might already use cast iron for your pots and pans and teapots in the kitchen. But you can also choose to have your new bathtub made of this material as well. Once a freestanding tub is in place, you can take advantage of an unusual optical illusion. Freestanding bathtubs take up more floor space. This attribute may not seem like a positive, but you won’t have to worry about your bathroom feeling cramped. Freestanding bathtubs are a classic version of this essential fixture. For those homeowners looking to drive up the nostalgia factor, don’t hesitate to echo a part of the past. Help make what is old new again. This entry was posted on Tuesday, March 27th, 2018 at 2:33 pm. Both comments and pings are currently closed.